Honeywell UV100E2009 SmartLamp twin 36 watt bulb system. 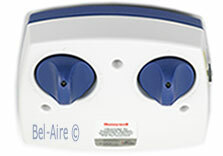 Has an air flow sensor that only powers the bulb when air flow is present, saving bulb life and energy. 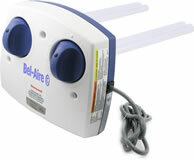 Designed to treat air flowing in the return duct. 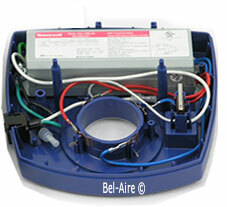 The UV100E2009 is a complete system (as shown in our photos) that includes the base unit with a 120v cord and plug. Two 36 watt bulbs and knobs are included. Three sheet metal screws are included for mounting the unit in the duct. The Honeywell UV100E2009 utilizes two 36 watt Philips Hot Cathode Germicidal Sterilamp™ Tube. Bulb life expectancy is 8000 hours. In 2002 Honeywell introduced SmartLamp technology. This is a new set of features that is built into some models. 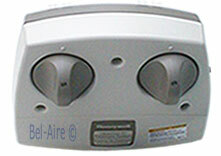 These models have an additional circuit board and may also have an air flow sensor. The UV100E2009 has the sensor. SmartLamp units include an LED indicator to provide a reminder on when to change the bulb. 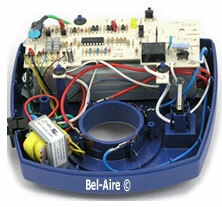 The SmartLamp circuitry monitors the actual run time and the bulb replacement is based on this run time. The LED will flash after 90% usage and turn on constant after 100% usage. 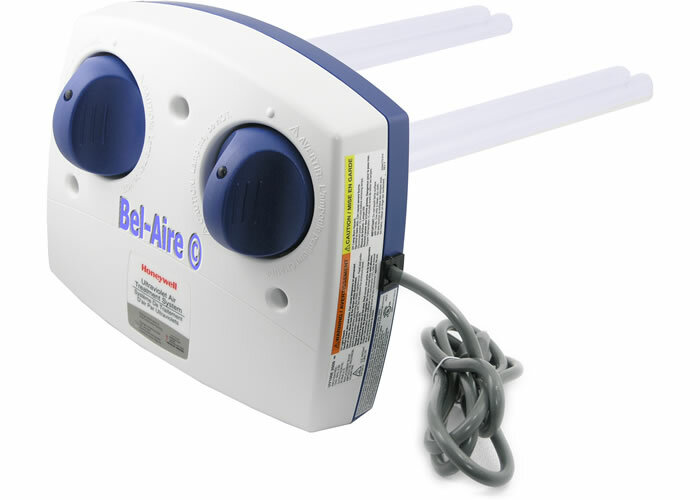 After replacing the bulb the reset button is used to restart the reminder cycle. The UV100E2009 has SmartLamp. The Honeywell UV systems (UV100E2009) have a safety interlock switch that prevents running the unit without being installed in the ductwork. 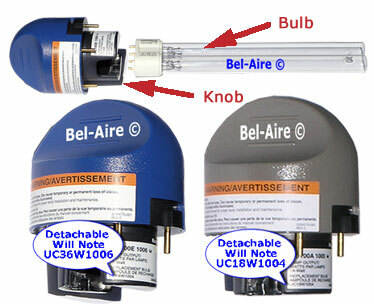 Also the dual lamp models require both knob/bulbs to be installed.